With over 40 feet of gorgeous, fully functional bar, the San Francisco School of Bartending provides a spacious, state-of-the-art training environment that must be seen to be appreciated. 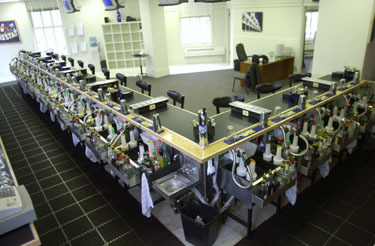 Our facility is part night club and part classroom, built to replicate every aspect of real world bartending. Every bartender-in-training is assigned to one of our eleven fully equipped workstations. We carefully manage our class size, and are committed to providing the ideal student/teacher ratio to our clients. Most people attend the San Francisco School of Bartending in order to secure employment in the beverage service industry. It is our mission to train you as one of the most competent, most marketable, and most efficient bartenders available to meet the growing demand for this occupation.